New Customer Registration: Customer touches [New Customer] icon and using the onscreen alpha-numeric keyboard enters their first name, last name, a phone number (the last four digits of their phone number is recognized as their Personal Identification Number (PIN) for orders) and an email address (optional). If the phone number entered is indentified as a cellular phone and, or an email address is entered, the customer can elect which to use for the computer to send a reminder text or email message to the them when their finished order is in the kiosk, ready to be picked up. Customer DropOff™: Customer touches the [DropOff™] icon and enters their Personal Identification Number (PIN) using the on-screen numeric keyboard and select a day which they would like to pick up their order from the PickUp™ based on service schedule & availability and if the Cleaner wants to service the kiosk twice a day to maximize use of the PickUp™, the customer selects early or late PickUp™ from a two week moving calendar which takes into consideration holidays. If capacity is full on the PickUp™ day selected by the customer based on prior requests, the customer is asked to select another day for PickUp™. The customer touches [Next] a barcode receipt for PickUp™ and copy to put in the order bag for the Cleaner is printed with customer information and PickUp™ day selected. The “push” DropOff™ door unlocks, and the customer pushes their order thru the door, the door self-closes and locks and returns to the home screen ready for the next customer. Cleaner PickUp™: Cleaner touches the [PickUp™] icon enters a master PIN and orders in the DropOff™ are displayed. The Cleaner unlocks the DropOff™ access door and removes the orders from the kiosk, touches the [Finished] icon, a list of the orders is printed which can be compared to the individual order brought to the processing facility and the screen returns to the home screen ready for the next customer. Cleaner DropOff™: Cleaner touches the [DropOff™] icon enters a four digit master code and, touches [Next]. The Cleaner enters a customer 4-digit PIN from the receipt attached to an order, and using the on-screen numeric keyboard enters the charges for the service $[20.50], touches [Next], the door to the locker selected by the computer unlocks and the service provider puts the finished order in the locker or drawer, closes it and it locks. When all orders are placed in the kiosk the service provider touches the [Finished] icon, a list of the orders is printed as well as an alert if a customer failed to pick up their order on the day they selected or if an order was scheduled to be put in a locker and was not and the screen returns to the home screen ready for the next customer. Customer PickUp™: Customer touches the [PickUp™] icon, enters their 4-digit PIN, touches [Next] and the service charges are displayed $[20.50] with instruction [Insert and remove your credit or debit card & enter PIN], the card is validated and charged for the service, the PickUp™ locker or drawer which their order is in is displayed, the locker or drawer unlocks, the customer opens it, removes their order, releases it, it self-closes and the screen times out and returns to the home page. 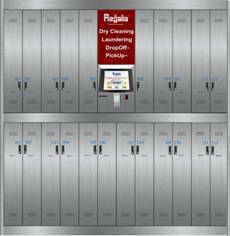 LOCKER Kiosks are 6.5’Wx2.25’Dx 6.50’H and have TWENTY TWO or TWENTY 6.5”Wx27”Dx36”H SecurShield™ locking self-closing lockers. Our kiosks have hidden lockable wheels & floor levelers for ease in placement and fit through all doors. 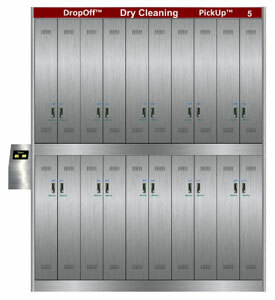 Lockers are used for both DropOff™ of bagged dry cleaning & laundering orders and PickUp™ of finished orders. The top lockers have a flat grooved hanger-holding bar across the width of the kiosk passing though the walls of each of the lockers providing a 6.5”W hanger-holding section in each and the lower lockers have individual 6”W pivoting flat grooved hanger-holding bars in each. An upper and lower locker can be used together to hold orders with long garments, by unlocking and lifting the hinged lift up floor of the top locker and pivoting the flat grooved hanger-holding bar in the lower locker and placing them flush against the wall of the lockers to create an unobstructed space 6”Wx27”Dx72”H. If an upper and lower locker is used together, the lower locker remains locked and the customer lifts the order out through the top locker. The bottom of lockers can be used for finished boxed orders. DRAWER or LOCKER Kiosks are 6.5’Wx2.25’Dx6.50’H and have TWENTY self-closing SecurShield™ locking drawers 15”Wx27”Dx15”H. Our kiosks have hidden lockable wheels & floor-levelers for ease in placement and fit through all doors. Drawers are used for both DropOff™ of bagged laundering orders and PickUp™ of finished orders. New Customer Registration: Customer touches [DropOff™] or [ DropOff™] icon, enters the initial of their first name, last name, a phone number and an email address. If a cellular phone is entered and an email address, the customer can elect which to use to send a message to the customer when their finished order is in the kiosk and ready to be picked up. DropOff™ Customer: touches a [DropOff™] icon and enters the last 4-digits of their phone number for identification using the on-screen numeric keyboard  and selects a day from the onscreen two week moving calendar which takes into consideration holidays on which they would like to pick up their order from the locker kiosk [M] [Tu] [W] [Th] [F] [Sa] [Su] based on service schedule and availability. If capacity is full based on prior requests the customer is asked to make another selection for PickUp™. The customer touches [Next] and the computer selects and displays a locker number, upper or lower, based on the [DropOff™] or [ DropOff™] icon touched when registering to use the service, a barcode receipt and copy to put in the order bag is printed with customer information and PickUp™ day, the locker door or draw unlocks, the customer puts their order in, the locker door or drawer self-closes and locks. 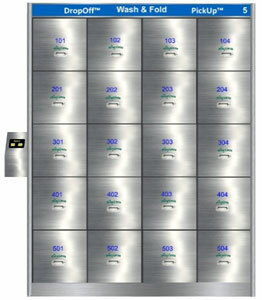 PickUp™ Service Provider: touches the [PickUp™] icon enters a master PIN and lockers with orders are displayed. When the service provider touches an onscreen locker number, the locker door, the driver removes the order. After the cleaner removes all of the orders from the kiosk the [Finished] icon is touched and the screen returns to the home screen ready for the next customer. PickUp™ Customer: touches the [PickUp™] icon, enters their identification code (the last four digits of their phone) touches [Next] and the service charges are displayed $[20.50] with instruction [Insert and remove your credit or debit card & enter PIN], the card is validated and charged for the service, the locker which their order is in is displayed, the locker door unlocks, the customer opens the locker door, removes their order, releases it, it self-closes and the screen times-out and returns to the home screen ready for the next customer. ©2018 eAnytime Corporation. All Rights Reserved.